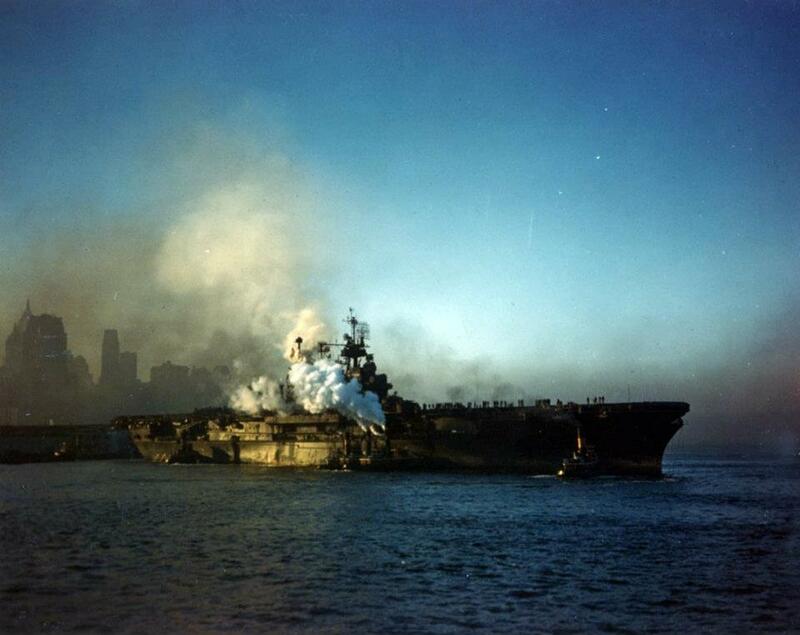 The Enterprise arriving in New York City on October 17, 1945. She had just returned from Pearl to the US mainland with almost 1,500 servicemen for discharge, and was in the Big Apple for the upcoming Navy Day celebrations. It is very hard to imagine the joy those men were feeling. Thanks, Craig. Love the fact that someone took those photos on EXACTLY this day. Making history more ‘here’. Love your new “series” David. That’s very nice, my friend. Thank you. I think. I know this is shocking, but I’ve never seen “It’s a Wonderful Life.” I think that makes me some kind of movie weird-o. I’m so embarrassed. But thanks for thinking of me. Oh, Jeff. You ARE missing a rare treat. Please do me a personal favour and give it a watch – preferably over the Christmas holidays – it is an absolute gem of a movie. You’ll thank me. I have been planning to see it. It’s a Christmas Classic. “It’s a wonderful life ” Dave Listers favourite film. Neil, now I’ve got this idea in my head of scratchbuilding Starbug. Yeah, with a T-Rex. Facing off in the cargo hold of Red Dwarf. Now we’re talking diorama! There is a guy who builds huge Starbugs from scratch on the net somewhere, I wonder where the original models from the series are ? Love that Big E picture! You know, Robert, I love that photo – and the fact it was taken today (73 years ago) makes it even more special. I cannot imagine for a moment how those guys felt setting foot back on mainland USA after those years at war. Agreed, David. I don’t get overly serious often, but this is one time. For Desert Storm I was only away for a bit less than 6 months, but touching down back home was unbelievably wonderful. I can only imagine what all those WWII vets (not just on the “Big E”) who were off to war for ‘Who Knows How Long’ or, as the US Military put it: “For The Duration” felt. Same for the guys from Korea or Vietnam. Hell, I came home to a 3-months old Daughter I’d never seen. What I experienced is nothing compared to guys who came home to a 2-to-4 year old son or daughter who has no idea who this strange man is who calls himself “Daddy!” It took a while for my baby girl to get used to me or ANY men, for that matter. All she knew was women! Thanks for the post, Jeff. I’ve four children (three of them taller than me, now) and was lucky enough to be there at all their births. I just cannot imagine being away for that first part of their lives, let alone being faraway, fighting, with the possibility of never seeing them. It makes me appreciate ALL my family more. Friends, too.